Special committee to formulate proposals with input from Microfinance Practitioners Asso. Finance Minister Mangala Samaraweera yesterday outlined fresh measures for the microfinance industry that include a new regulatory body for the sector and amendments to the Microfinance Act as part of Government efforts to write off microfinance loans of 75,000 women across 12 districts and reduce levels of indebtedness countrywide. Samaraweera told reporters the Government had allocated Rs. 1 billion for the write-off, which would be rolled out in collaboration with the Microfinance Practitioners Association. Under the new measure, women who have obtained non-consumption loans of Rs. 100,000 or less and defaulted on their payments for three months before 31 June 2018 will be eligible to have their loans written off by the Government. The interest payments will be absorbed by the relevant microfinance companies. “Finance and microfinance companies have been instructed to send their lists to the Treasury by the end of August. The lists will be verified by the Government Agents of these areas and submitted back to the Finance Ministry. The Treasury will then compile a final list as recommended by the Government Agent and release letters to finance and microfinance companies assuring them of payment in biannual instalments over the next five years,” Samaraweera said. All the companies that partake in the write-off will also have to cap interest rates of future or new loans at 35%. The Finance Ministry expects to begin releasing letters supporting the write-off to companies in September. Borrowers will be issued a separate letter from the Treasury confirming the settlement of their loans. However, if any woman has multiple loans only the highest loan that is Rs. 100,000 or less will be written off by the Government. “We consider this situation to be a national tragedy and needs to be addressed,” the Finance Minister said. He emphasised that the Government had selected these areas given the dire need and extremely high levels of indebtedness that had spilled over as major social issues, particularly in the Northern and Eastern provinces. Samaraweera stated that the Government considered it their “inherent moral responsibility” to assist women struggling under microfinance debt and focused on where they felt the strongest need existed for relief. The Finance Ministry is also planning to appoint a special committee to discuss additional measures to tackle indebtedness through discussions with the Microfinance Practitioners Association. Amending the Microfinance Act, making it mandatory for microfinance companies to register with the Government and introducing a new regulatory body for the industry are also measures under consideration, the Finance Minister said. Proposals that have been studied and compiled by the Central Bank over the last two years to regulate the industry would also be fast-tracked, Samaraweera assured. The proposals by the Central Bank include efforts to make it compulsory to report the financial operations of licenced microfinance companies to the Credit Information Bureau or CRIB to maintain customer records of clients attached to microfinance companies, similar to the banks and finance companies and extending deposit insurance to microfinance clients. To safeguard depositors, a depositor insurance scheme, similar to banks and finance companies, is expected to be activated to cover microfinance companies in the future. The insurance scheme, which begun for banks and finance companies about a decade ago, is now a Rs. 44 billion fund and grows by about Rs. 10 billion each year, according to the Central Bank. This allows the regulator to meet any shocks in the financial market and a similar arrangement will be introduced to microfinance companies. Finance Minister Mangala Samaraweera yesterday said he was unaware of any proposed salary increase for parliamentarians. 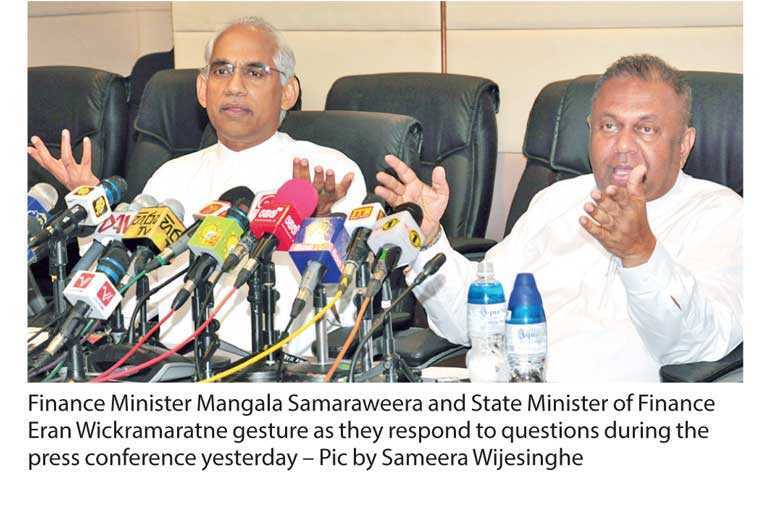 Samaraweera, responding to questions during a media conference, noted that he had not been informed of any plans to increase the salaries of lawmakers and noted that he was personally against any attempt to raise payments. “I have not been notified. I do not sit in on meetings of party leaders so I do not know what is discussed. However, I have not heard of any such measure. Wherever they make the decision it has to come to me because at the end of the day the funds are allocated by the Treasury,” he said.